“If you want to be a better photographer stand in front of more interesting stuff!” – Jim Richardson, National Geographic photographer. A good scenic location guide can save you from wasting hours of precious time searching for the best spots at a new location. The best scenic locations guides are written by and for photographers. Photographers are much more in tune with what other photographers want to photograph. And for each location, photographers will tell you the best season of the year and the best time of day to get the best images. Some will give you additional photography advice for each location. Amazon links for all of these books (except for the Canadian guide books by Wiggett) are throughout the article and also at the end of the article. I begin with guide books to the U.S. national parks, then move on to guide books for the rest of the country, and then guide books to the Canadian Rockies. 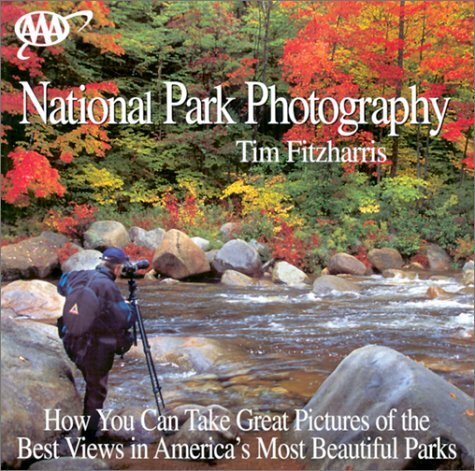 If you are heading for the national parks, your first and best bet is to get is How to Photograph America’s National Park, Digital Edition (the new edition) or National Park Photography (older edition) by Tim Fitzharris. This is my favorite guide book to photography in the best of our national parks. Tim gives you the best hot spots for each park and lots of photography advice. It is a great book to take with you when you photograph the parks. Tim lists the best seasons for doing photography in each park. The underlined seasons are better, and if a season is marked with an asterisk* that is even better yet. The exceptions are Bryce Canyon, Grand Canyon, and Zion which are, from Tim’s point of view, are equally wonderful all year around. How good is his advice? Colorado is the state I know best and I have been going to Rocky Mountain National Park for years. Tim’s says it is worth visiting Rocky Mountain National Park in summer, fall, and winter, with summer and fall being the very best seasons. You should skip Rocky Mountain National Park in the spring. From my own experience I agree with Tim’s assessment. Based on other places I have been and comparing them with Tim’s recommendations, I am happy to say his advice is solid. There are two versions of his book, both are out of print, but you can get either version inexpensively via Amazon.com at the links below. Tim’s book is usually in the car with me when I head out for one of our national parks. 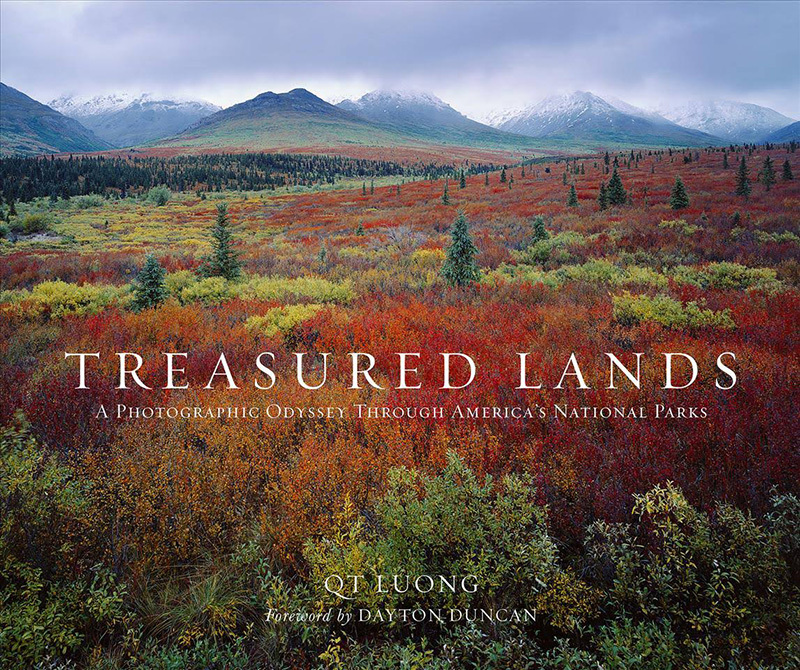 Treasured Lands by Q.T. Luong is far and away the best collection of photos taken in all of our national parks. This is a cross between a big, beautiful; coffee table book and a photo location guide. It doesn’t give you a lot of photography advice, like Tim’s book above. What makes it so valuable is that it gives you the location for every photograph in the book. If you see an amazing photo and want to know where it was taken, you can look up the location. It also covers all 59 national parks while Tim’s book covers 20 of the best national parks plus a few additional locations. This fall I went on a spur of the moment trip to Acadia National Park. I didn’t want to carry Luong’s book with me, since it is so big, so I pulled it of the shelf and photographed every page of the Acadia National Park chapter with my iPhone. 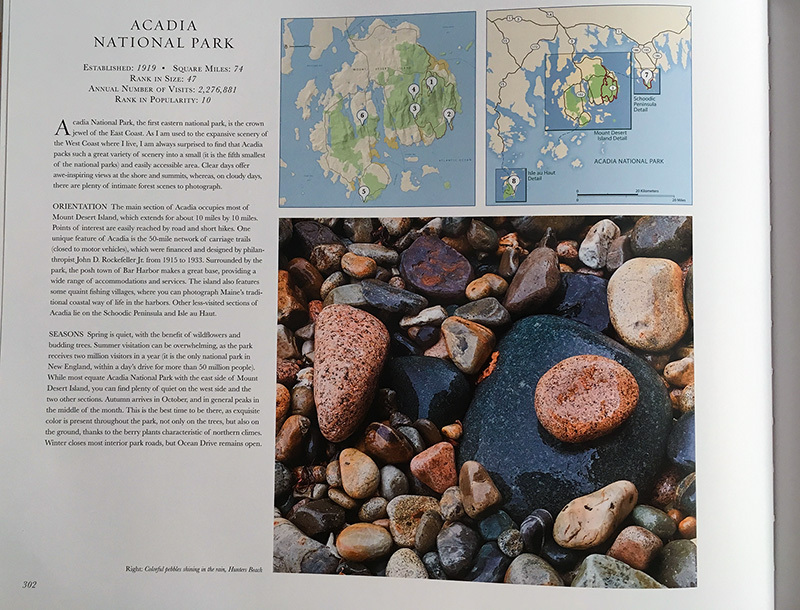 I used those iPhone photos (examples below) for reference while I was in Acadia, along with the chapter on Acadia in Tim’s book which I did take along with me. 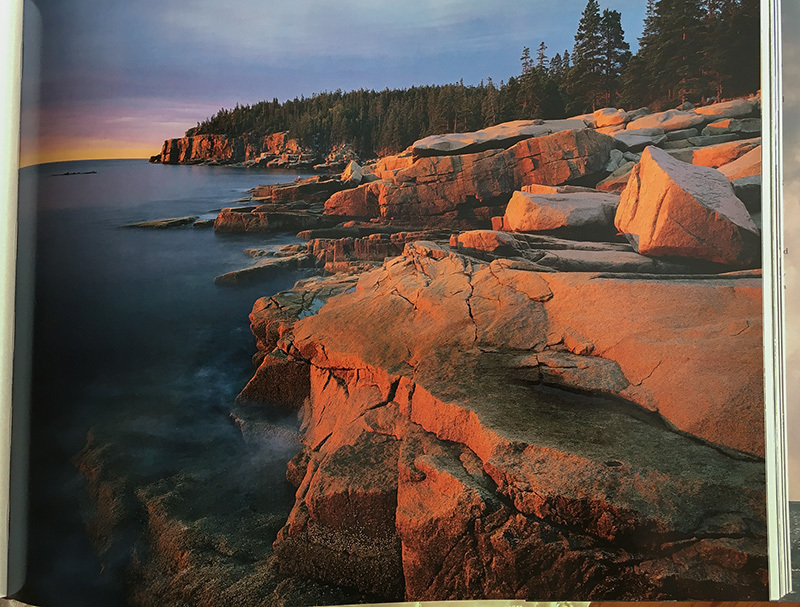 Some classic Acadia locations were in both books, but each book had some great locations that were not in the other book. Granite Ledges and Otter Cliff. Photo by QT Luong in Treasured Lands. Each night at the end of the day I checked the weather forecast (weather helps determine the kind of location) and then looked at the Acadia chapter Tim’s book and the photos on my phone of the Acadia chapter in Luong’s book and I picked the locations I planned to photograph the next day. Acadia National Park photo location map in Treasured lands. Both books provide maps. Tim’s book has fewer locations but more detailed photography advice. 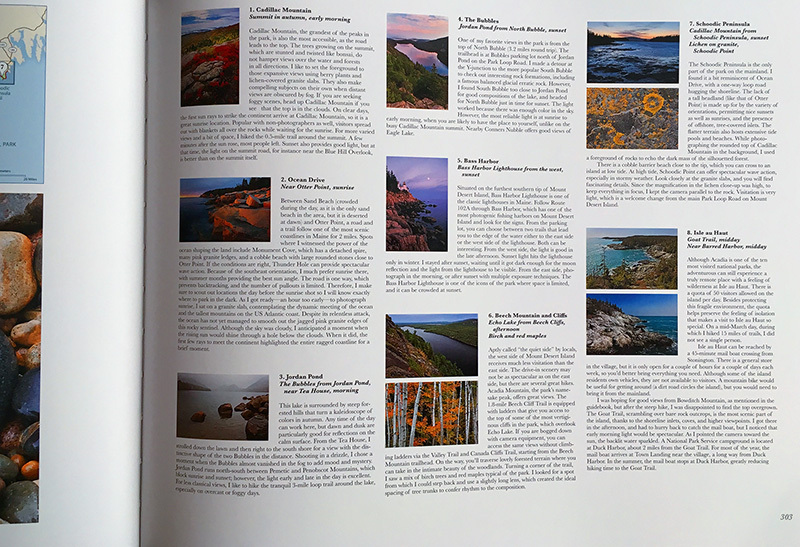 All of the Acadia photos in Treasured Lands with location descriptions. Luong’s book has more photo locations but less photography advice. Ocean Drive location description in Treasured Lands. Click for a larger version. An example of the location information in Treasured Lands. Photographer’s Guide to the Grand Canyon & Northern Arizona by Joseph K. Lange, If you are going to the Grand Canyon, this is the book to get. For all of Arizona get Photographing the Southwest, Vol 2 by Laurent Martres which is described below. Photographer’s Guide to Yellowstone and the Tetons by Joseph K. Lange. If you are heading to Yellowstone and/or the Tetons, this is the book to get. An award wining photographer, Lange is also the author of my favorite introduction to landscape photography. Guide to Photography and the Smoky Mountains by John Netherton. My favorite guide to the Great Smoky Mountains, plus it is an excellent book on nature photography, even if you never make it to the Smoky Mountains. The Photographer’s Guide to Yosemite by Michael Frye. This is one of my two favorite photography guides to Yosemite National Park. If you only have a day or so to spend in Yosemite, get Hudson’s book. He hits the highlights. If you have more time to spend, or if if you already know Yosemite, get this book by Frye. Frye is a photographer’s photographer and he will tell you in a lot more detail what you need to know. This is the book to get if you are serious about spending some quality photo time in Yosemite. This is the more detailed of the two books. PhotoSecrets Yosemite by Andrew Hudson. This is one of my two favorite photography guides to Yosemite National Park. If you are new to Yosemite or only have a day or two to photograph Yosemite, get this book. Hudson hits the highlights, has photos, maps and diagrams, and suggestions as to where you should be and when. If you have more time to spend, or if you already know Yosemite, get Frye’s book. If you are going to get PhotoSecrets San Franciso and Northern California, also by Hudson, don’t buy PhotoSecrets Yosemite because every page of the Yosemite book is included in the San Francisco/N. California book. 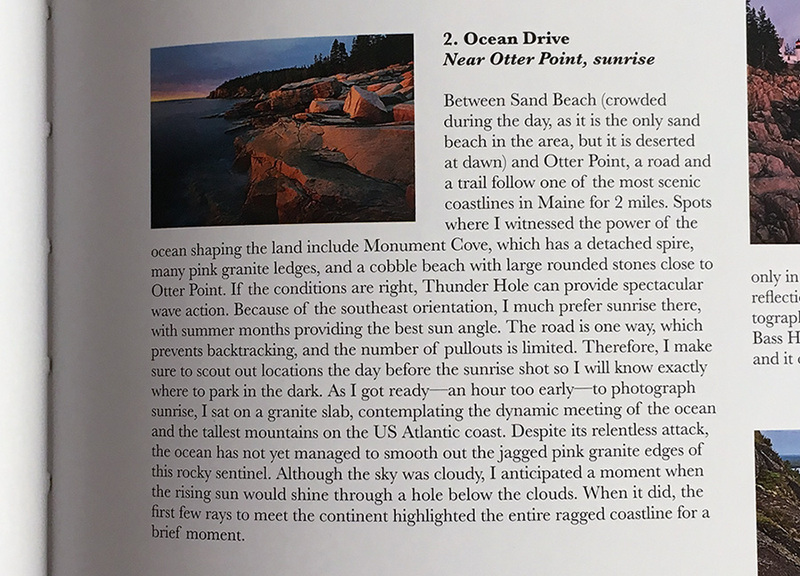 Photographing Acadia National Park: The Essential Guide to When, Where, and How by Colleen Miniuk-Sperry. This is an award winning five star book. If you are going to Acadia, this is THE photo guide to get. This book is the winner, of the 2014 New Mexico-Arizona Book Awards “Travel Book” category and winner of “Best Travel Guide/Essay,” and “Best Interior Design” in the 2014 International Book Awards. Check out the glowing reviews at Amazon. There are specialized books that cover a specific national park, state, or region of the country in significant detail. Some of these books also include national parks in their coverage of a specific state or region of the country. 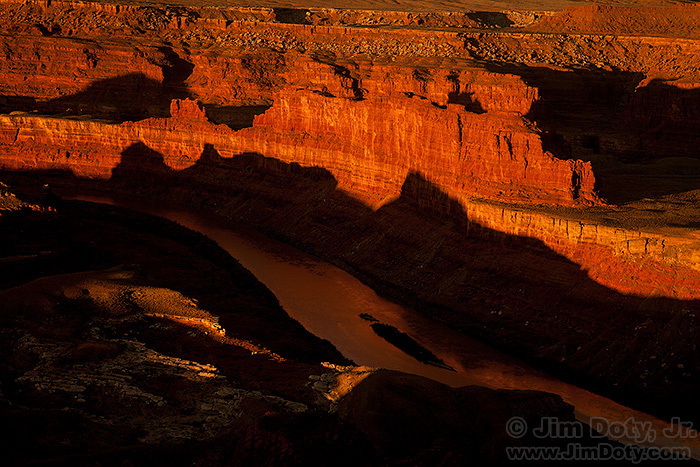 The Photographing the Southwest series by Laurent Martes is a truly superb example. He wrote three books covering the desert southwest and they are as good as it gets, not only for deciding on the time of year to show up, but also detailed information on the time of day, how to shoot, how to get there, and more. Each location is rated on a scale of 0 to 5 (using hearts, diamonds, spades and clubs) for Scenic Value, Photographic Interest, Road Difficulty, and Trail Difficulty. The only other books that are as well done are the Colorado books below by Lee Gregory. 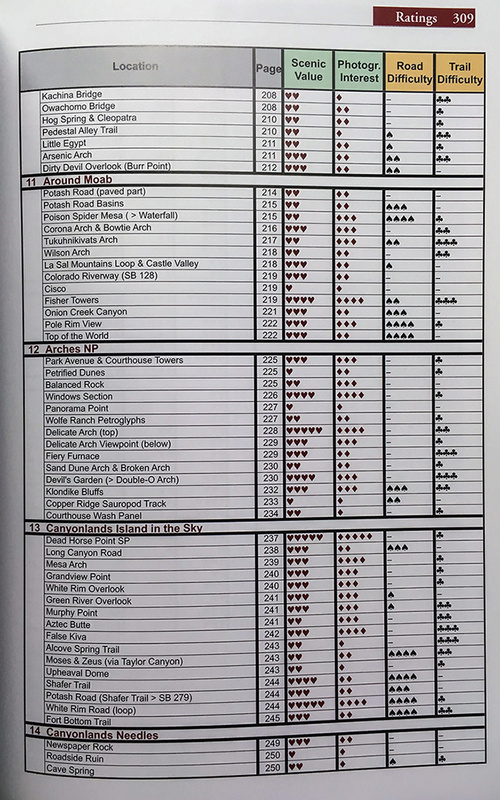 One of the ratings pages from Photographing the Southwest, Volume 1. Click for a larger version. This is one of the ratings pages. Lets look at one example. In Section 13 the first location is Dead Horse Point State Park. The visual and photographic interest is 5 which is as good as it gets. The dashed line for Road Difficulty means it is a paved road to the location that any vehicle can navigate. The Trail Difficulty is 1 which means it is an easy short walk from your vehicle to the viewpoint. You go to the page 237 for specific advice on the best time of day and the best way to photograph the location. 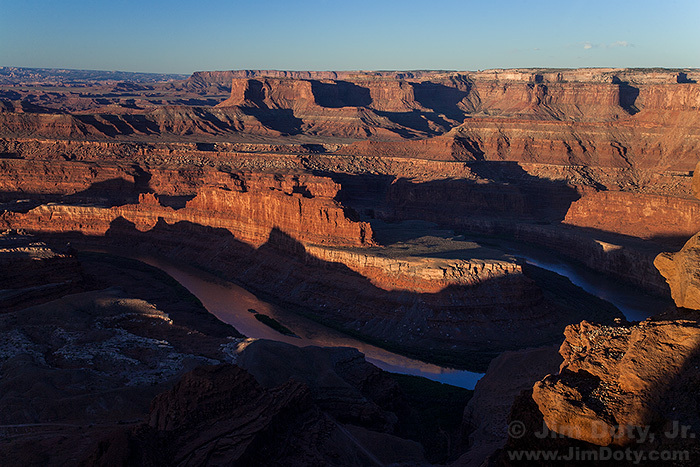 Dead Horse Point, early in the morning. I followed his advice to be there early in the morning and created these image. If you are going to the desert Southwest (Arizona, New Mexico, Utah, and Colorado), these books are an absolute must. They are the gold standard for photography location guides. They provide good coverage for the national parks in each of these states, as you can see in the page above. Martres has also picked photographers to write or co-write books in the series for other states (Washington, Oregon, California). For my home state of Colorado, Colorado Scenic Guide: Northern Region and Colorado Scenic Guide: Southern Region by Lee Gregory are first rate. Like the books above by Laurent Martres, Gregory rates locations for scenic value, kind of roads, the length and difficulty of the trails to the locations, the best seasons for each location, and the best time of day for photography. If you are headed for Colorado, be sure to take note of the Stewart Green’s Scenic Routes and Byways, Colorado in the next section. Since one of Laurent Martres’ series (Photographing the Southwest, Vol 3) covers Colorado and New Mexico, should you get Laurent’s book on Colorado or Gregory’s two volume set? That is a tough call. I bought Gregory’s books long before the Martres series was available. The Martres book covers more locations, but in less detail per location than Gregory. Martres devotes about 120 pages of volume 3 to Colorado while Gregory’s books cover Colorado in about 400 pages. I obviously chose to buy all three books to have the more comprehensive details in Gregory’s book and the longer location list in Martres’ book. Sometimes it is the journey, not the destination, and there are excellent guides to the best scenic drives in the United States. All of the guides below are for scenic drives that are officially recognized as “National Scenic Byways”. The National Geographic Guide to Scenic Highways and Byways is an excellent one book guide to the best scenic byways in the Unites States. National Forest Scenic Byways and National Forest Scenic Byways II, both by Beverly Magley, are an excellent two book guide to the best scenic drives throughout the Unites States. This two book set is out of print (and volume II is getting very hard to find) so grab these books while you can at the Amazon links in my photography store. Another option is the new replacement series which is also written by Beverly Magley. There are three books in the new series: the National Forest Scenic Byways – Far West, the National Forest Scenic Byways – Rocky Mountains, and the National Forest Scenic Byways – East and South. The three books set covers all the drives in the original two book set, plus more, so don’t get the original set if you get the new set. 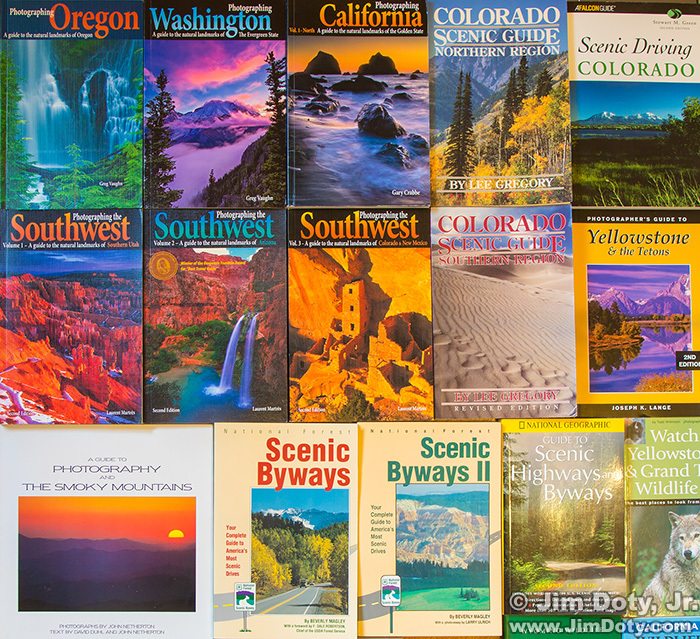 If you want more scenic drives in each state, the national scenic byways series is also available in individual books for several states. These books have a lot more scenic drives per state than you will find in the one, two, and three book series that cover the whole country. 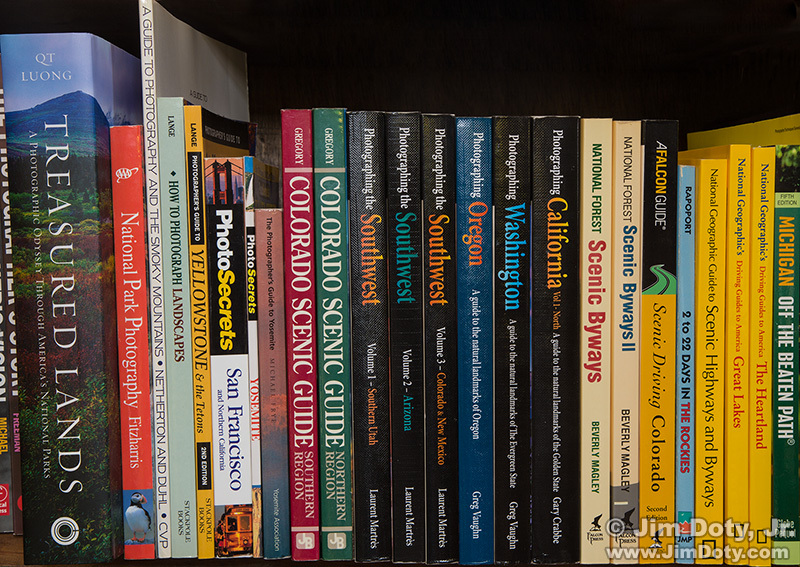 For example, a one, two, or three book series that covers the whole country will only cover 4 to 6 of the national scenic byways located in Colorado. In comparison, Scenic Routes and Byways, Colorado (4th edition) by Stewart Green (an excellent book) covers 30 Colorado scenic byways. The third edition, Scenic Driving Colorado, is also available. Stewart Green also wrote Scenic Driving Vermont. Some of my favorite photo location guides. Click for a larger version. Darwin Wiggett’s photography guide books to the Canadian Rockies. Darwin Wiggett wrote an excellent photography guidebook for the Canadian Rockies. It was already out of print when I discovered it and I couldn’t find a new copy on Amazon for less than $150 or a used copy for less than $50. Fortunately for me, Darwin turned his print book into a series of eBooks that you can buy at his site, one for each national park. The original printed book was 144 pages and covered all the parks. Each eBook covers one national park, each book costs $10, and they are about 90 to 200 pages in length. The coverage of each park is a lot more detailed than was possible in the original printed book. Such a deal! If you get all 8 books at once, the cost is $60. I was planning a four day photography trip to Banff National Park, so I bought his guide for Banff (114 pages of information). It was a great decision. 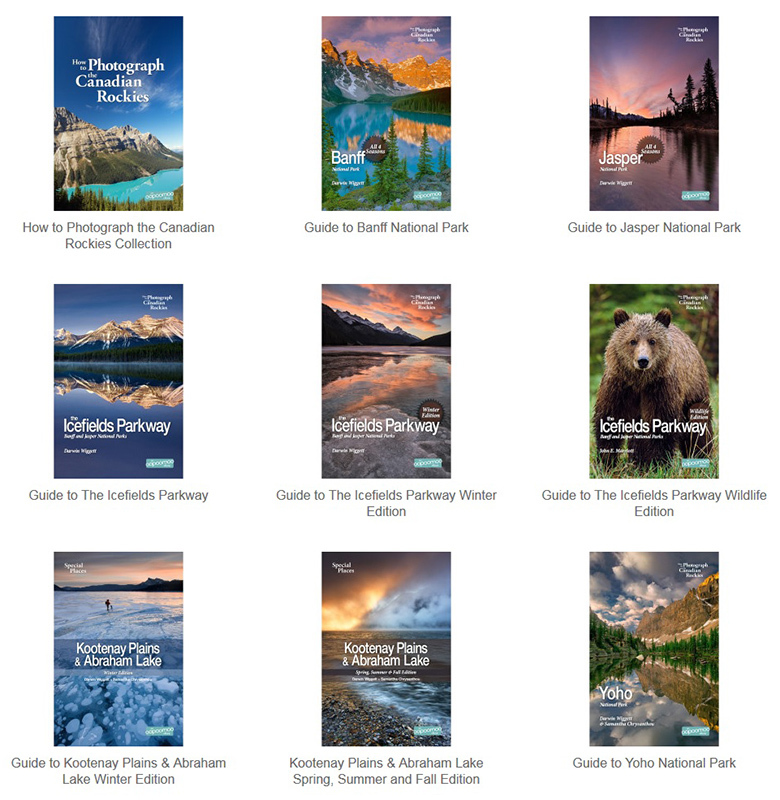 If you are headed for one of Canada’s national parks, get Darwin’s photo guide for that park. A photographer’s tip: I put the eBook on my laptop, but I didn’t want to carry the laptop with me during the day. Each night when I planned the next day’s excursions, I took my iPhone and photographed the pages of the book I would need right off my laptop screen. That way I had what I needed on my phone. All of my favorite photo location guides (except for Wiggett’s) are in the Scenic Photo Locations Guides section of my photography store. This entry was posted in Books by Jim. Bookmark the permalink.